Shows starring Celebrity Chefs touting their restaurants, cookbooks and cooking shows have become a staple of the airwaves today. 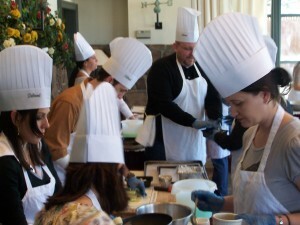 With so many people interested in cooking and international cuisines, The Desmond is pleased to offer a selection of Group Culinary Events and Team Building exercises built around food preparation. These Events are designed to encourage creative thinking and build a basis for positive group dynamics and communication skills for your meeting attendees. This can be done without leaving the hotel and the different venues can be tailored to whatever time frame works best for your group. Create a memorable experience for your group in a friendly atmosphere, and by the time the meal is served everyone will have spent quality time problem solving, delegating and cooperating in the kitchen. And the best part is that they get to enjoy what make!